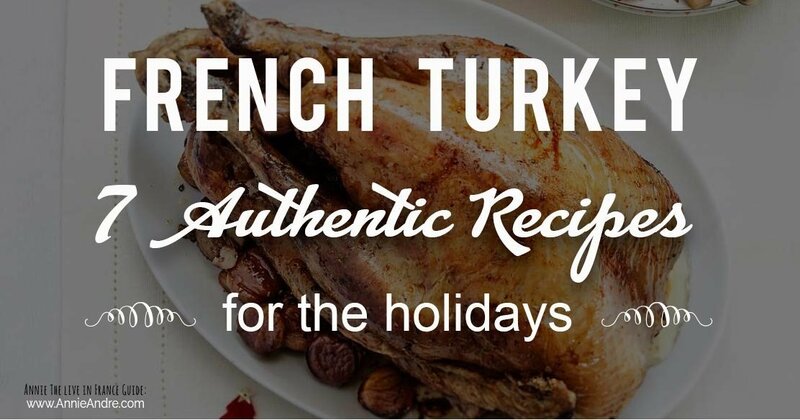 Believe it or not, the French really do eat turkey and have beaucoup French turkey recipes to prove it. 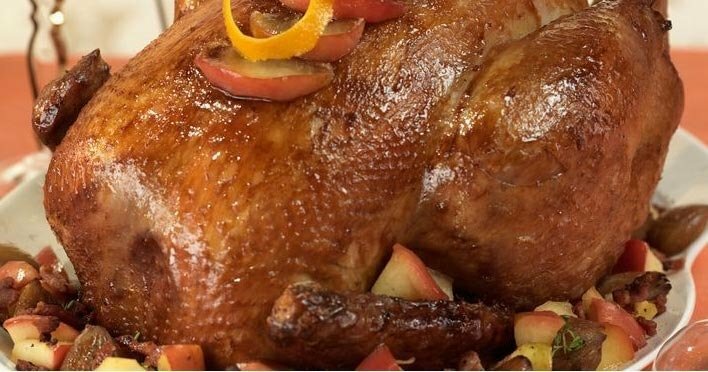 Here are seven turkey recipes using typical French ingredients which you can cook and serve to your guests for your Thanksgiving and Christmas holiday meals. Bon apétit! Around Thanksgiving, you won’t find 15-pound turkeys at any of the French grocery stores in France because Thanksgiving is an American and a Canadian holiday. You can, however, find plenty of turkey drumsticks, turkey deli meats and turkey breasts all year round but never a whole turkey. The exception is at Christmas time. 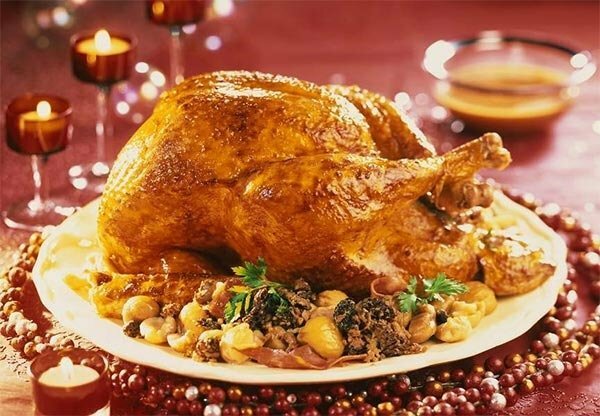 Whole turkeys in France are usually reserved for the Christmas Eve meal (“réveillon de Noël”). 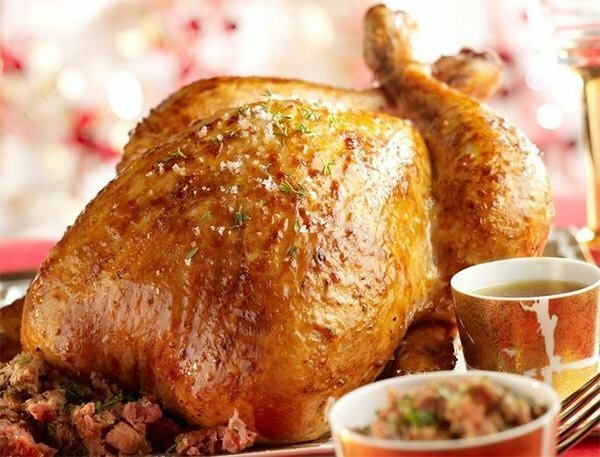 It’s called a Christmas Turkey (“Dinde de Noel” ), and it’s been a French tradition to serve a stuffed roasted turkey for Christmas since the 19th century. Prior to that, only the rich could afford turkey- it was still fairly rare in Europe and considered an exotic dish. 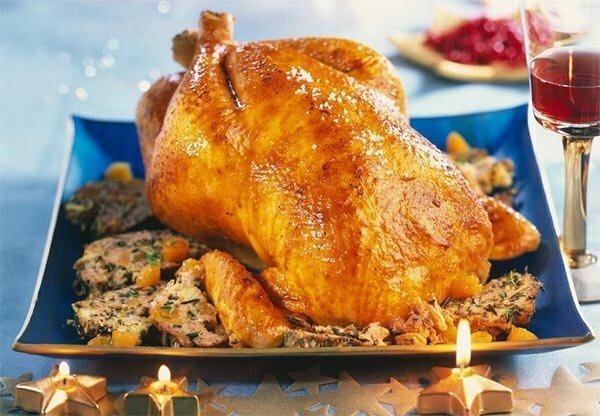 Like North Americans, the French have their own unique way of cooking a roasted turkey for the holidays but using cranberries in the stuffing or as a side dish is not one of the ingredients the French typically use in the French turkey recipes. Instead, you’re more likely to find a rotating list of ingredients which many North Americans might not be accustomed to using in their holiday turkey recipes such as..
You might be interested in reading Weird foods: Can you stomach New Year’s Eve in True French style? 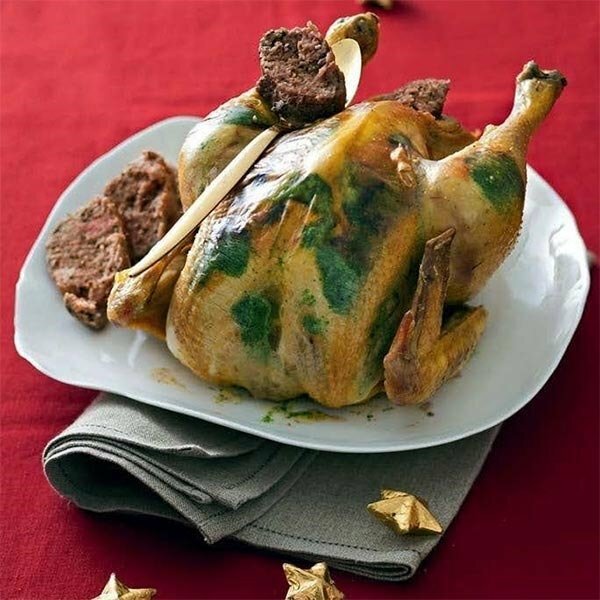 In addition to using ingredients not typical in North American holiday turkey recipes, the French tend to prepare their holiday turkey a little differently too. 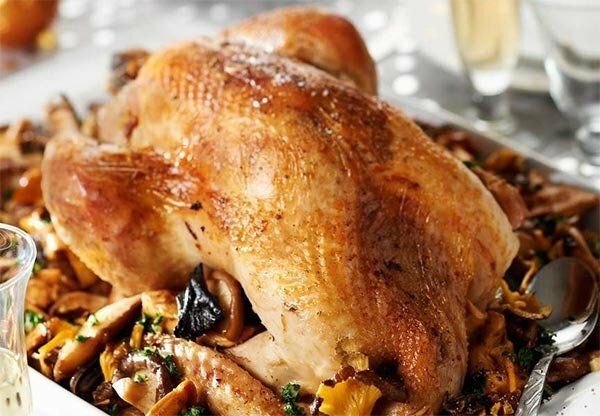 For instance, instead of dry roasting, they roast their birds with a stock in the roasting tin, which keeps the flesh moist, juicy and fall apart tender. (in general but not always, it just depends on the recipe). Here are 7 actual French recipes in French with links to the translated English version of that recipe (so you know they’re really French). And remember that Thanksgiving isn’t celebrated in France so these recipes are usually reserved for the Christmas meal in France but I think they would make an equally exciging and delicious Thanksgiving meal if you don’t mind using certain French ingredients. The translated version of turkey stuffed with foie gras and apples is here. The translated version of Stuffed Turkey Roasted With Escargot butter can be found here. Translated version of Turkey stuffed with gingerbread and foie gras is here. The translated version of Turkey with chestnuts and chanterelle mushrooms ( and truffles) is here. 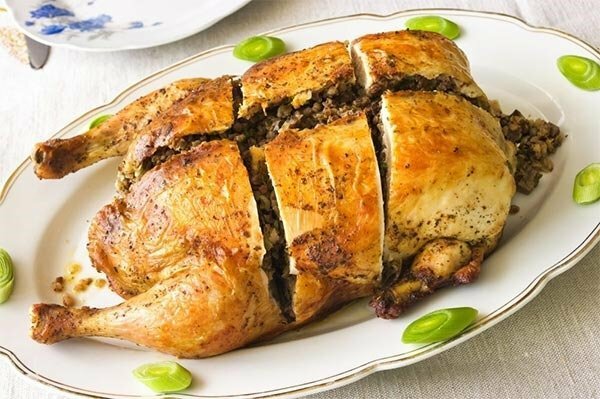 The translated version of Stuffed turkey with morel mushrooms and pan-fried chestnut is here. The translated version of this Turkey stuffed with dried apricots is here. 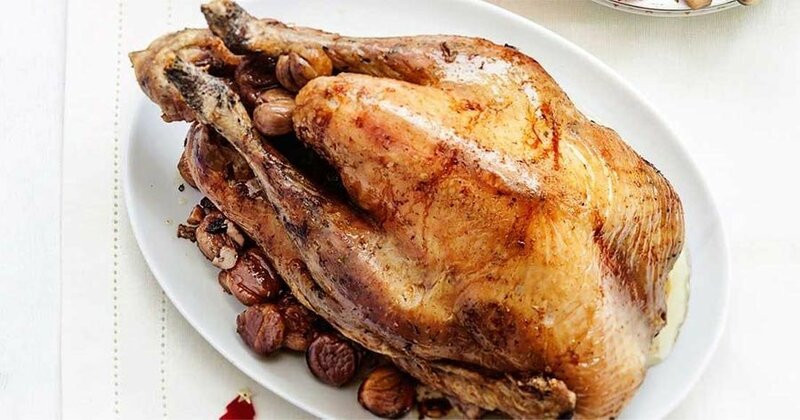 The translated version of Black and white stuffed turkey recipe is here. This recipe deserves a little explanation: What is the black and white part? A white looking sausage usually made with a white meat such as ground pork-sometimes referred to in English as white pudding. It can be found in grocery stores throughout France all year round but is most popular during the holiday seasons. Although the spices used to make these white sausages can vary depending on the recipe, all boudin blanc contain bread crumbs and cream which are then slowly boiled in water which is what gives these sausages their white appearance. If you’re lucky, you might be able to find some boudin blanc and boudin noir at your local grocery store. Especially if they carry French products. If not, you can safely purchase boudin blanc and boudin noir online since it freezes well. For you ambitious people determined to make your own boudin blanc, you can make boudin blanc or any sausage for that matter at home if you have the proper sausage making tools which include a sausage stuffer and sausage casings to stuff the meat into. If you have a meat grinder, you can grind your own meat. If you already have a KitchenAid mixer, you can simply buy some Kitchenaid attachments which does everything I described above. Here are some Turkey and Thanksgiving vocabulary for you. In France, French people call Thanksgiving “Le Thanksgiving” but in Quebec it is called “jour de l’action de grace” . apple pie = tarte aux pommes. Etre le dindon de la farce. = To fall victim to, to be duped. Une dinde= A stupid, pretentious woman.